According to the top ten Taiwan ICT market trend predictions of 2013 published by IDC, as reaction to the uncertainty of prosperity in the next year, the enterprises will continuously increase IT budget and expenditure with primary growth power from cloud computing, mobility and the market driven by massive data, and expects a robust growth of 3.9%. To respond to these trends and needs, the storage devices will definitely continue to develop toward energy-saving, high efficiency and compactness. 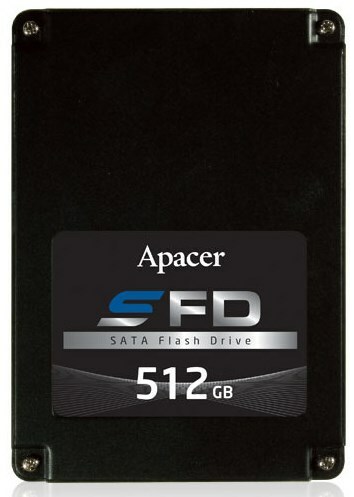 Therefore, Apacer correspondingly launches three SATA 3.0 SuperSpeed transmission interface SSDs, including 2.5-inch SFD 25S-M, MO-297-compliant SFD 18S5-M and mSATA S1-M designed in compliance with MO-300, respectively applicable for cloud data center, various servers, embedded system, and compact Ultrabook and Networking devices, which meet different needs for cloud, massiveness and mobility. The SATA 3.0 hyper-speed transmission interface SSDs launched by Apacer deliver a bandwidth of 6.0 Gb/s, upgraded from the original 3.0 Gb/s, achieving double transmission capacity. By fully adopting the latest SF-2281 B02 control chips of SandForce, it also boasts the super-speed transmission efficiency, a maximum sequential read/write speed of 555/550 MB/sec and IOPs up to 60K, making it as efficient as RAID consisting of nearly a hundred of mechanical hard drives and easily solving the bottleneck facing mechanical hard drives at the moment. Besides, with significantly increased transmission speed and read/write efficiency, the power consumption is actually reduced by more than 50% compared with the previous generation of SF-2281 B01 control chip. Furthermore, in order to improve the data reliability, these three products are all equipped with 55bit ECC (Error Correcting Code) function, S.M.A.R.T (Self-Monitoring, Analysis, and Reporting Technology), ATA Secure Erase, Windows 7 TRIM command for optimization and AES 128bit encryption mechanism for data protection which improves data security. Jeff Lin, Embedded Application Business Unit Director of Apacer, suggested that, "in the cloud computing era, the compact mobile devices are becoming increasingly common. Therefore, when designing SATA 3.0 series products, Apacer has taken into consideration the needs for compactness and reliability of various devices. For 2.5-inch SFD 25S-M SSD, in addition to the standard thickness of 9.5mm, the metallic and plastic casings are designed for customers to choose for various applications. For compact mobile devices, the 7mm series are available, which are suitable for Ultrabook, compact notebooks etc. Regarding MO-297-compliant SFD 18S5-M and mSATA S1-M with a size equal to one-third the size of credit card, the stability during the operation of the system has been considered. To be more securely attached to the motherboard, the products feature the screw holes, which enhance system reliability. They are the optimal choices among professional storage solutions and extremely suitable for small network devices, tablets and other mobile devices. In addition to offering the outstanding product specifications, Apacer builds the most stringent manufacturing process with over ten years of market experience, highlighting that firmware and components can be fixed upon customers' verification, and provide unique part number so as to ensure the stable supply. Such service quality has passed the certifications required by Tier-1 tech giants in the U.S. and Japan, enabling Apacer to become one of the top ten PC SSD suppliers in the world. Jeff Lin, Embedded Application Business Unit Director of Apacer, further explained, "Apacer is always taking customers' opinions as priority for operation policies. Therefore, SFD 25S-M, SFD 18S5-M, and mSATA S1-M adopt the most cost-effective MLC chip, available in capacity up to 512GB. When the enterprises choose SATA 3.0 SSD, the diverse requirements can be met, including high efficiency, capacity and low cost, along with the needs for cloud computing, massiveness and mobility. Apacer offers the prime storage solution for computer providers, system integrators and end users. Samples of new SFD 18S5-M and mSATA S1-M are now ready for customers to run tests. SFD 25S-M will be available in February 2013.